"The recipe is for individual cups (you'll need 8-10 clear, 7 ounce plastic cups), but I believe you can use a bucket instead." In a large bowl, combine milk and pudding mix. Beat with a whisk until well blended. Let stand 5 minutes. Add whipped topping and half of the crushed cookies and fold in. Place 1 Tablespoon crushed cookies into each cup. Fill cups 3/4 full with pudding mixture. Top with remaining crushed cookies. Refrigerate 1 hour. Decorate before serving. Suggested Decorations: small paper umbrellas, gummy worms, gummy sharks, candy stars, chopped peanuts. See how to make amazing mini tiramisu treats. I tripled this batch for 1st graders they loved it. We loved it licked the pot clean. Easy and simple. Fun for picnics, the kids make it and clean up, so easy!! We used a bucket and shovel to serve. They LOVE it, try MUD, use chocolate pudding, oreos and Gummy worms! I use this recipe all the time. 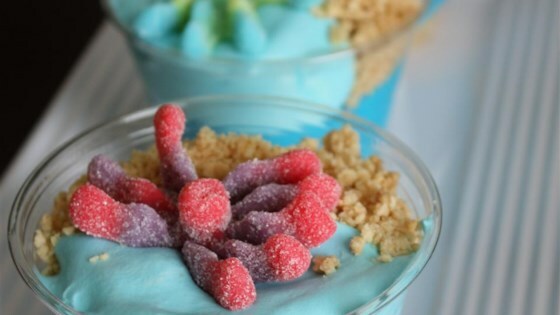 My kids love it and request it as a special dessert whenever they are asked.